Intel Core i5-460M and i3-370M are used in most of the laptops, they are the new generation Dual Core processors. Intel Core i5-460M has a CPU speed of 2.53 GHz, cache is 3 MB Intel Smart Cache, 2.5 GT/s bus speed, maximum turbo speed of 2.8 GHz, with core ratio of 19, 766 MHz of Graphics maximum dynamic frequency, advanced technologies like Intel Turbo Boost Technology, Hyper threading technology, Virtualization technology, Fast memory access, Enhanced speed step technology, Flex memory access and etc. Intel Core i3-370M has a CPU speed of 2.4 GHz, cache, bus speed and instruction set are same as Intel Core i5-460M, core ratio of 18, graphics maximum dynamic frequency of 667 MHz, 2.93 GHz of maximum turbo frequency, advanced technologies like Hyper threading technology, Virtualization technology, Fast memory access, Enhanced speed step technology, Flex memory access and etc are present which are also found in Intel Core i5-460M except for Intel Turbo Boost Technology. The i5 460 offers a reasonable performance boost compared to the i3 370, but to see a considerable performance boost other features of the laptop also needs to be better. If the price difference is more than $50 it doesnt make sense to upgrade to i5 460. CPU Benchmark – 2569, CPU Speed – 2.53 GHz, Cache – 3 MB Intel Smart Cache, Bus Speed – 2.5 GT/s, Code Name – Arrandale, Thermal – 105 C, Number of cores – 2, Instruction Set – 64 bit, Graphics maximum dynamic frequency – 766 MHz. CPU Benchmark – 2206, CPU Speed – 2.4 GHz, Cache – 3 MB Intel Smart Cache, Bus Speed – 2.5 GT/s, Code Name – Arrandale, Thermal – 90 C for rPGA 105 C for BGA, Number of cores – 2, Instruction Set – 64 bit, Graphics maximum dynamic frequency – 667 MHz. Yet again we are back to one of the popular qustion in the site.. which is the best laptop processor in terms of Price vs Performance. And also a look at the most popular notebook processors. Below is the list of popular notebook processors and their rating in CPU Benchmarks. With the increase in the numbers you can notice the performance numbers not moving significantly up, also for the price vs Performance ration T6600 is still the best bet. 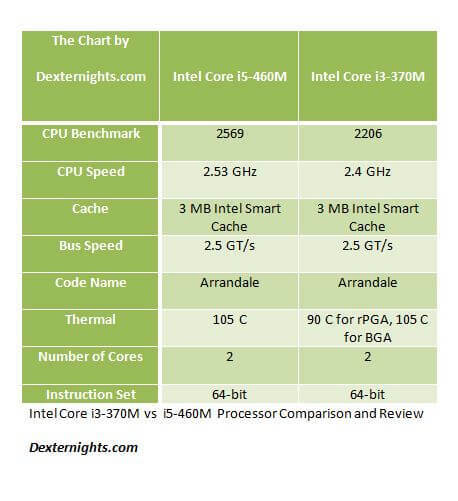 Also one should keep in mind that we have entered the post Core 2 Duo era, Intel lists all the core 2 Duo processors as retired versions but still 99% of the laptops are sold with either one of the above processors. So whats after the core 2 Duo ? Core i3 , i5 and i7 and some high end models of Dell Studio XPS offer the Core i7 processors. The new processors definitely give a huge performance boost compared to the old C2D processors. Below is the two new kids on the block. And you can clearly see the performance numbers skyrocketing with these i7 processors. From the Festive Season of 2008, the Intel Core 2 T6400 has been the most popular among all the laptops sold, almost all the models had this processor (for mid range). Well Now Intel has launched a upgrade for the Intel Core 2 Duo T6400 processor, with a new Intel Core 2 Duo T6600. Unlike the last upgrade say from the T5800 to T6400, this upgrade isnt major. Both T6400 and T6600 are almost the same except the Clock speed and that too a difference of only 0.2GHz. The T6400 is clocked at 2.0GHz and the T6600 runs at 2.2GH. Other than this difference everything else is the same. Both models support Intel 64 technology, package type is Micro-FCPGA. Now as per CPU / Processor Bencmark of the T5800, T6400 and T6600 the following are the results.